King Machine and the IGF How Would You Like It To Work? So you're writing your own language ? Excellent news. Is it a middle-term project to let the (very) advanced user learn and use KMScript for level editing and modding purposes ? That would be pretty cool. Aside from the big runners (Blizzard RTS games…) which virtually have the number and power to design whatever they want, a successful ex-Indie developper like Nadeo (maker of Trackmania) announced during the Paris Games Week a couple weeks ago that they developped a similar subproject as yours (high level triggers, actions and properties) named ManiaScript, which they want to implement in their current and upcoming releases, for the community to maintain their games living. Building VMs like this is an ancient and time-honoured tradition. e.g. Infocom's Z-machine, LucasArts' SCUMM, or the myriad of modern games which use Lua to tie together all the low-level bits. Given that ActionScript is a pretty decent dynamic language in its own right, it ought to be possible to cheat and use a light wrapper around actual ActionScript. The complicated part is disconnecting your script's flow of execution from your application's flow of execution; you want to execute a couple of VM steps, then go and check for events and do game stuff that needs doing, then go and do more VM steps, etc. I don't know ActionScript; Lua lets you do this sort of thing easily via coroutines. 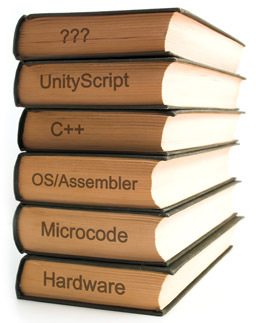 Does ActionScript have anything like that? Threads, iterators, etc? @Paladin – I certainly like the idea of opening everything up to players eventually. Whether coding directly in KMScript would be the right way to go, though… not sure. It makes more sense to me to simply give people access to my own level design tools. But yes, sooner or later documentation will be needed! Luckily I don't need to write a powerful language. Everything it does can be relatively simple. I'm thinking of a stack-based architecture a little like PostScript, but with a bit more state (sort of like registers, maybe?). "and before you know it you're building an even worse copy of Python"
Ok, that made me sincerely laugh. (Website seems to be down, but the cache has all the contents.) Page title: "Bootstrapping Forth in 40 lines of Lua".